Millennial investors would be willing to take on more risk than their baby boomer counterparts during a crash, but their confidence hasn’t been tested by GFC-style market turmoil. It noted that 15 percent of millennials (people aged between 18-36 years old) would be willing to go against the grain and invest in higher-risk assets during a market crash — as opposed to their baby boomer counterparts who would move to more secure assets such as cash. But while millennials have been given a taste of market turmoil during the Bitcoin crash of 2018, they haven’t lived through a wide-ranging crash like the GFC. “It is possible that a lack of experience is behind the optimistic viewpoint that the millennials have as they are too young to have been materially impacted by bear markets such as the GFC, tech wreck, or Asian currency crisis,” Legg Mason’s managing director in Australia and NZ, Andy Sowerby, said. More broadly, millennials are turning out to be more optimistic investors than their baby boomer counterparts — with 66 percent of millennials saying they were optimistic about the future while 49 percent of baby boomers made the same claim. It comes as no great surprise, given millennials are starting to enter the market to build their wealth — because they simply have more time to rebuild if things go wrong. In Australia, millennials also have the benefit of a formal and mandatory superannuation system to fall back on. While millennials are willing to embrace alternative assets, their optimism isn’t making its way to equities. Legg Mason found millennials had 21 percent allocation for equities against 27 percent for baby boomers. It’s why Sowerby said while millennial investors were generally optimistic about retirement outcome, this wasn’t showing up in their investment strategies. The rise of the millennial investor has played out over the last couple of years, as they start to earn greater pay cheques and start thinking about their wealth management strategies. It’s a good thing then that they appear to have a higher level of investment literacy than their baby boomer counterparts (42 percent to 23 percent). Millennials have also shown that their motivations for an investment run deeper than a monetary return. It’s hardly surprising give consumer habits, but environmental and social impacts play a larger role in investment decisions for millennials then they do for baby boomers. Two-thirds of millennials said they choose funds or companies to invest in according to ethical considerations, while less than a third of baby boomers did so. What’s more, 82 percent of millennials surveyed said they would pay “slightly higher” investment fees if it meant their money was being invested responsibly. Overall, 86 percent of millennials and 73 percent of baby boomers said that having their money in funds that only invest in responsible companies is important to them. The rise of the millennial investor has piqued the curiosity of fund managers, launching products aimed at securing their investment. For example, Raiz (formerly Acorns) has been in-market with a micro-investment app — allowing people to invest their spare change in a management fund. Customers can link their account to their credit or debit cards, rounding up daily purchases like a morning coffee to a certain price point — with the remainder going into the fund. As of August last year, the average account had $1,234. Like superannuation app Spaceship, Raiz is predominately accessed through a mobile phone app. READ: What’s in a phone? 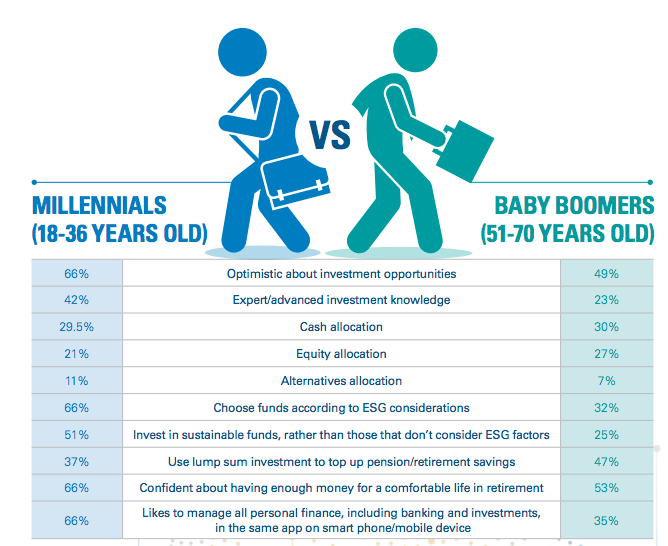 This fits into how millennials are accessing investment opportunities, according to Legg Mason. It found 66 percent of millennial investors like to manage all their financial investments through a mobile phone, opposed to 39 percent of baby boomers.